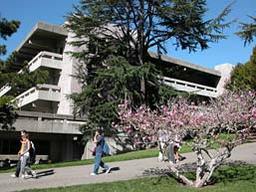 Moffitt Library invites University of California Berkeley undergraduate students to display their art for the academic year. We feel that the library is a highly visible and appropriate venue for such exhibits. Displays of art and design expose scholars in Moffitt to the range of creativity of their fellow students. There are also two permanent pieces of art created by the Oakland based artist collective Five Ton Crane. Both pieces are hung on floor 5 of Moffitt Library in the Haas-Herscher Gallery. In support of the University of California system commitment to Zero Waste 2020, the 2018-19 theme for undergraduate student art in Moffitt Library was #MyLastTrash. Artists were asked to submit works to support personal reduction of trash or to reflect how our world is affected by climate change. This is how the future will be. We will have to go to museums to view nature. The natural world around us will no longer be around due to pollution and tearing down trees. This is a mountain Santa Rosa. It is a beautiful picture. I am submitting this because we really should appreciate nature more. The photo is named after a Monet painting that looks very similar. Amazing that something that could only be imagined in a painting actually exists. Soon we will have to imagine beautiful nature because it won’t exist at this rate of pollution. This is a photograph of a hummingbird sculpture that I made. Its larger-than-life size allows the materials to shine. Each part of the structure is comprised of a scrap or upcycled object — the meaning, once it all comes together, is that there is beauty in everything, and, moreover, we need to take care of nature and all of its fragile beauty. A mirror reflects everything that we are looking at and recognizes what we don't notice. This installation describes how we dispose of various things in our lives. The wood was discarded at Jacobs Hall at UC Berkeley. I collected them and combined into the word "ECO" to change our perspective on climate change. YOU can make a difference! Don't be the average American who creates 4.4 POUNDS OF TRASH EVERY DAY. Do you want to be responsible for air pollution caused by producing plastic? Do you want to be responsible for plastic contaminating our oceans and killing sea life? Little by little, you can make sure that your life doesn't have a harmful impact on our planet or the animals (humans included!!) in it. I made this infographic for my advertising class and wanted to share it because sustainability is a passion of mine! There are so many easy ways to fight throwaway culture and reduce the amount of plastic you contribute to landfills! Imagine a world in which tech, innovation, and nature all coexist. The work What Could Have Been depicts just that. It portrays an alternative future to the road society is on now: a path that can be achieved via the Zero Waste Initiative. These paintings were meant to celebrate the beauty of natural, compostable materials such as wood and natural pigments. They were created using biodegradable paints to avoid the use of toxic chemicals usually found in oil paints and paint thinners (which not only pose a respiratory health hazard to the artist because of the toxic fumes, but pose a risk to the environment if not disposed of properly) or acrylic paints (which are made from petroleum-derived ingredients, such as acrylic, vinyl, or PVC). They are also painted onto wooden panels instead of a gessoed canvas to avoid using gesso (which is a mixture of chalk and artificial binders that must be sanded down to paint on, releasing particles into the air). Using reusable water bottles would greatly reduce the waste generated by plastic bottles. This image is an illustration of how the water's contamination of many years is an impending disaster. The weight of all this waste will crash on the younger generation unless we decide here and now to take a stand and clean up. We also must learn how to live sustainable lives and coexist with this natural world in a way that will save it for the future. This map was designed to trace the pathways of electronic waste globally. The sources are identified in red, and the destinations are identified using green, distinguished further by identifying destinations that are known and ones that are suspected due to the high volume of illegal dumping involved in electronic waste exportation. By utilizing GIS and Illustrator, I developed this map to show not only the routes themselves, but also the magnitude of the waste being exported (identifiable though the size of the points). This map is tasked with telling the story of e-waste and why it is such a global issue. The Robinson projection was chosen to amplify the concept that most e-waste is exported from the North and dumped in the global South. This has to do a lot with the economic differences between the two. This map also points out the top 10 electronic waste producers and indicates which countries deal with the waste internally and which ship the waste to be dealt with elsewhere. This exposes a difference in the industries of particular countries such as the United States and China. The columns on the side of the map were created to give a more detailed narrative of the issue that the map represents.